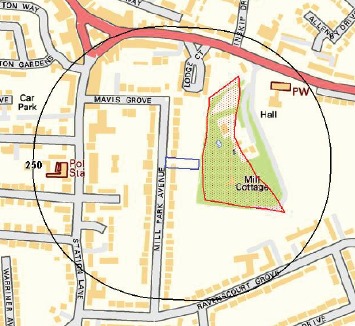 Given the close proximity of a historic landfill to the site a contaminated land planning condition was attached to the decision notice for the proposed development. As well as the landfill, a sand pit and a number of in-filled ponds were identified as potential sources of ground gases. As part of the walkover survey the nearby landfill was inspected and given the landfill was in fact an excavation with mature trees within the excavation. Based on the walkover observations the landfill was discounted as a credible source (there was no evidence of landfilling) and the desk study report did not propose any further works. The conclusions of the report were accepted by the planning authority and the condition discharged.